معلومات مثيرة ... بارك الله بك ..
لكن سمعت ان الصفقة الاصلية هي 60 طائرة لتحل محل التوبوليف . وصلت منها 30 عام 1990 ولم تم اكمال البقية ... فها هذا صحيح ؟ ! 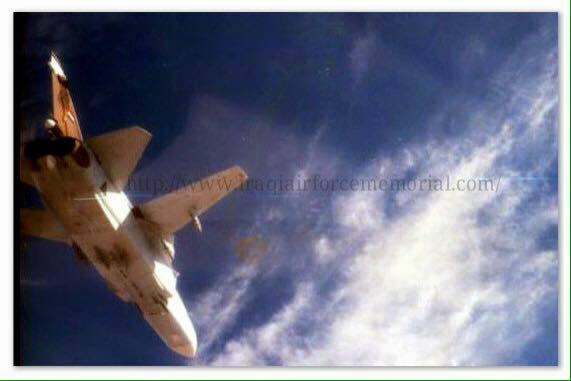 Photos probably taken at al-Bakr AB. The two fuel tanks are 500 L tanks for MiG-21. Below and aft of the tanks are B-8M1 rocket pods. Delivered probably with the Su-24MK or maybe with the last (3rd) Su-25 batch ? The large vertical objects next to the standing rocket pods are SPPU-6 gun pods. For Su-24MK. The SPPU-6 is 5 meters long and weighs 525 kg. The pod mounts a flexible GSh-6-23 23mm cannon and holds 500 rounds of ammunition. If i may ask for your help in yet another puzzle regarding IqAF operations in 1991, this time regarding the mighty Su-24MK. According to Tom Cooper in "Iraqi fighters 1953-2003", during the Su-24s evacuation to Iran, a couple of F-15Cs attacked a Su-24 at low level, fired a total of 7 (seven) misiles at it, but they all missed (! ), being decoyed by the Sukhoi's automatic countermeasures. This engagement is described as "quite famous", unfortunately i haven't been able to find any other reference to it on the www and some F-15 books i've read, so if i may kindly ask, do any of you gents know about this encounter, like who the iraqi pilots were, their memories of this incident if any, whether you have any info as to the identity of the F-15s and so on. I assume this incident must have happened on January 27, 1991, as apparently that is the date the Su-24MKs were evacuated to Iran. from what I heard from the pilots of the Sukhoi-24, pilots who took the planes to Iran who did not mention or refer to that such incidents occurred with them. The planes were flying low-flying, causing collision accidents in some of the aircrafts in the mountains and crashed and killing of their colleagues. I think it's Tom's fantasy for thrillers! I do know of one SU-25 from Balad AB which crashed in Iran whilst evacuating in 1991. It was flown by a friend of my cousin, and he died in the crash. That's the only reason I know about it. yes I didn't notice. looks like russian numbering! I think that Iraq did have some aircraft serialized with English numbers (eg. Super Etendard, Mirage F-1). If anything, the paint is probably the biggest give-away of it likely not being Iraqi, since bare-metal is more of a PVO rather than Iraqi style.